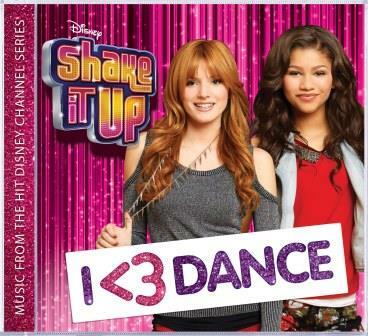 Recently, Child's Play Communications sent Diva & I a copy of the "Shake It Up: I Heart Dance" album to review. All opinions and obsession with "Dancing with the Stars" are my own. Anybody have a tweenaged daughter in their house? Yes! Anybody have Disney Channel being watched by said tweenager? Yes! Anybody ever heard of the name Zendaya? Yes! Anybody watch "Dancing with the Stars"? Yes! If you answered yes to at least three of those questions, you probably are familiar with The Disney Channel TV show "Shake It Up." The show targets 6-11 year olds and is doing a great job of it considering they are in the #1 slot for that time frame amongst that demographic. "Shake It Up" is about best friends who want to be professional dancers and have sort of realized their dreams by becoming back up dancers for a popular TV show - a show within a show. Diva likes the series. I think it's a bit of fluff but nothing that is offensive or undermining unlike some other shows she could be watching. I feel similarly about the music. It's all fluffy candy pop but again, since no one is singing about someone's derriere or illegal substances, I feel much more comfortable about her listening to this album than regular pop radio tunes. The album features 12 dance tracks from the show's third season and has collaborations with many other Disney stars. I particularly liked the remake of Nancy Sinatra's "These Boots are Made for Walking." The tunes are catchy and trendy and make you want to, well, dance! I hear you saying, "What does this have to do with DWTS?" Well let me tell you. One of the "Shake It Up" stars, Zendaya, is on the current season and is the youngest competitor ever to perform. With the success of Disney stars in the past, she was destined to do well. However, I'm not sure anyone thought she would do this well. I expect nothing less from Disney though. They seek out those triple threat kids to mold into stars. If you would like to get the "Shake It Up: I Heart Dance" for your tweeniebopper, you can download it from iTunes or Amazon. You can also keep up to date with all things musical from Disney at Disney.com/music their Facebook and Twitter. My kids are far from being tweens but they all like the show. I agree with your assessment about it being fluff but at least it's not offensive. It's so easy for dance moves to cross the line, but I think the show does a good job with keeping it clean. The only thing that bothers me is that C.C. 's character is so... not smart. It seems that every Disney sitcom has the Smart One, the Dumb One and the Joker. OK so I sooooo have been daydreaming that I am on DWTS! This season is awesome and Zendaya just blows my mind! My kids love to dance and watch dancing but we have never watched this show. May have to check it out! Anybody actually secretly wish that they could be trained by a professional dancer, get glamed-up, drop several dress sizes, and promote a career via DWTS? Hahahaha! The answer for both of those is yes for me as well ;) :D Zendeya is amazing on DWTS--I expect she'll make the finals!